At D.W. McMillan Memorial Hospital, we believe that home health is an increasingly important option to offer our patients during their time of recovery. We are proud offer home health services through D.W. McMillan Home Health to help patients seamlessly transition from the hospital to home. Home health care is convenient, cost-efficient, effectively reduces the risk of avoidable readmissions and supports faster recovery and patient independence. For many patients, recovering in the comfort of home has a therapeutic value that enhances the healing process. Under the direct supervision of physicians, home health clinicians help patients of all ages make the transition to post-acute care at home. 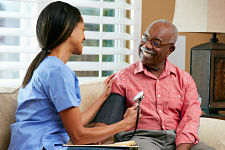 Home health care professionals help patients recovering from illness, injury or surgery, as well as people living with chronic conditions such as diabetes or congestive heart failure. The hospital and its home health agency have fine-tuned a system that helps patients manage health care costs, reduces readmission rates and provides a full continuum of home care - from recovery and chronic condition management to assistance in maintaining a healthier and more fulfilling lifestyle. The office is open Monday through Friday from 8:00 a.m. to 5:00 p.m.